Serve POWER lesson | ADD 10mph+ to your serve! In today’s video we’re going to show you how to add at least ten miles per hour to your serve. All right we’re going to talk about serving. Serving is very vital to the game of pickleball. Yes, it starts the point it, starts the rally in a game but al it sets up everything from there on out. If I hit a very weak serve, the return should be very strong, because they’re gonna have an easier time handling that serve. The harder serve I hit the easier my third shot potentially will be and the weaker their return may be. I see a lot of beginner and intermediate players playing and they’re out there, they learn the game, and many times they’re just out there, they’re hitting very consistent serves and they’re all going. They’re all going in which is great but there’s just not a lot of power or spin on their serve. They’re hitting these nice deep serve, all our serves should be deep. Depth is always good to have but as they hit their serve it just kind of is just kind of flat and there’s not a lot of action and not a lot of pace or power on that serve. One thing I see them doing is they’re basically just using all arm they’re not initiating a full body serve which a serve should be they’re just hitting it just like this and that’s nice and consistent but it’s not going to maximize the power that you potentially can have. The first thing is I would like to tell you is the serve really starts at your feet and with your legs. Specifically the legs are the strongest muscles in your body and they’re much bigger. My leg muscles are much bigger than my arm muscles. I want to start with that. I want to get low. I want to bend my knees. One thing is if I see people standing straight up with their knees. You can’t get any power from your legs because your knees are locked. We want to make sure we get down low and as we start our serve we have all our weight load it on our back foot. For me that is going to be the right foot. As I load my weight on my back foot and I’m going to hit the ball and I’m releasing the ball I’m transferring my weight. It’s a weight transfer from my back leg to my front leg. As you can see, as I toss this ball and I’m going to hit this ball as a serve, instead of just using my arm like this, I will get legs loaded and I’m then gonna unload them and as you can see my hips turn and my shoulders turn as well after I push off starting from the legs. I’m initiating these core muscles which are really important for the serve and really important to get that action on your serve. It really all starts in the legs. 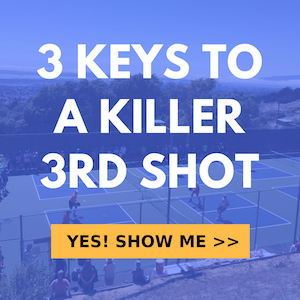 We want to get this shoulder turn, and we want to really turn our hips and as we hit this ball, as I hit the serve my shoulders and my chest is going to be facing more towards the net and not towards the side as they start. I have my feet you can see is perpendicular to the net. I’m not in this open stance you’re gonna get more torque and you’re gonna get more power as you turn like this, just like you were to throw a baseball or a football. Anything like that you’re not going to get a lot of power like this you really want to be sideways. You can use that core, use the legs, use that full rotation on that throw. On that serve, here we go, it’s gonna look like this when I load with my legs. Many times I step in and exaggerate it a little bit as I hit this ball and I’m opening up, my forward momentum is pushing me into the court after contact, and it’s just a little exaggerated. But the main thing is we want to make sure we’re conscious of using our leg muscles our core muscles and we’re turning. Here we go as you can see there’s a lot more pace on that serve than before I want to really get low use my use my legs muscles and my core muscles and I want to really step in on that. Notice the difference the very first one I’m just using my arm which could be really consistent but I really want to make sure I’m initiating all the muscles in my body and I’m making sure I’m turning contacting that ball out in front I could have more pace oh my serve. Go get out there with a bucket of balls and practice on your serve. I think it’s gonna really help benefit your game it’s gonna get you easier points on your serve it’s gonna allow you and your partner to more easily get up to the net. Make sure you’re using all your muscles in your body and initiating these leg muscles, initiating your core and coming out and turning your shoulders and following through over your offhand shoulder.